Mo and I met at my very first job (I won’t say what year that was but I will give you a hint: we did not have computers and people smoked with abandon right in their offices). We were young and single together and did lots of young, single things. Like go to church and work on our hope chests and go to church. Basically, lives of monastic devotion and asceticism and that’s all any of our kids need to know. If I could only bake four of the 14 or 15 varieties of Christmas cookies I make every year, these four would probably top the list. 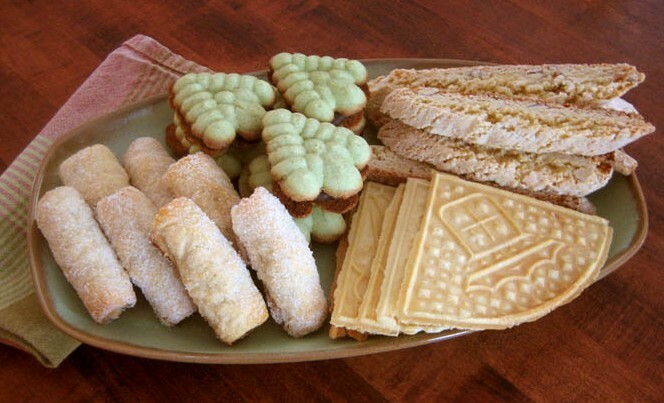 They’re all tasty, look lovely when arranged on a plate together, and fraught with the memories of Christmas’s past. My Aunt Mary was the only person I knew who had a pizzelle iron. This was quiet the fancy gadget when I was growing up. She would make these lacey, buttery cookies every Christmas. As a child I remember eating them while admiring her Christmas tree adorned with bubble lights. She had all the cool stuff! It was a real treat eating cookies the size of dinner plates. Aunt Mary always made them with the traditional anise seed, but they are equally delicious when flavored with peppermint, or my favorite, lemon. You can add a few tablespoons of finely grated lemon zest to the recipe to replace the lemon extract. My Nanna who lived with us when I was little was an extraordinary baker. Every day it seemed there was some marvelous aroma emanating from the kitchen. 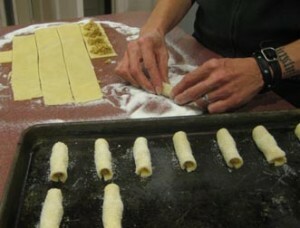 She loved to make what we called cookie-press cookies; little buttery, tidbits in fanciful shapes. This recipe is hers embellished with a little food coloring and mint chocolate filling to make tasty cookie-press Christmas tree sandwiches. What can I say? The best cookie I’ve ever eaten and the story that goes along with the recipe is just as good. My Nanna lived in a small mining town in Southwestern Pennsylvania. The social life of the town revolved around the Catholic Church, with each immigrant community celebrating Mass and feast days absolutely separately. There was no mingling among the ethnic groups. Now Nanna was a German who married an Irishman so already we know she was a bit of a rebel. Nanna was on a quest for the perfect nut roll recipe. Rumor had it a woman in the community, Mini, had the best. Mini however was Italian. It was during the celebration of an Italian saint that Nanna marched into the church hall, laid out with all the Italian delicacies, and full of all of the Italians. It caused quite a stir to have an outsider in their midst. Undeterred by whispers and stares, she found Mini, tasted her nut rolls and knew she had found the ultimate recipe. My Nanna and Mini became fast, best and life-long friends. Love of baking, after all, is a bond that trumps any prejudices. Mini was forever known to me as Aunt Mini. When I was little we used to go to her house to celebrate New Years Day, with nut rolls served along with so many other cookies, pastas, homemade pizzas…all so delicious. Somewhere Nanna and Mini are smiling. Thanks, Kate. The nut rolls are joining my list! Great post, Kate. Hey, how long do you think these nut rolls store for? That’s a good question. I can tell you that because of the number of cookies I make every year, I start very early in the season and freeze most. The nut rolls freeze very, very well in air tight bags (I usually seal them in 2 double seal freezer bags) and thaw out perfectly retaining the texture of the pastry. In fact Mini’s daughter who, using her mother’s recipes, has a seasonal cookie business, starts her nut rolls in early fall and freezes them for Christmas delivery. Hope that helps! And hope you enjoy the recipe! These cookies rock! Mucho gusto Momo! Ooooh, a pizzelle iron. Now that is a neat gift for a cook.